Its taken some time, but I finally have a name for my Cadian Imperial Guard- The Black Jacks. The name is taken from their use of 'spades' and 'diamonds' on their armor. I suppose that some units also carry the 'hearts' and 'clubs' as well. But those would be regular infantry, saving the 'spades' and 'diamonds' for the veteran troops. 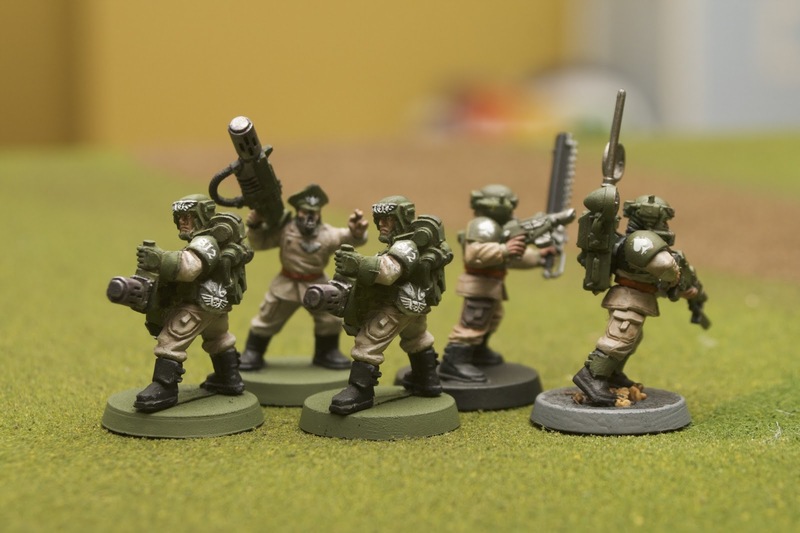 The Black Jacks incorporate both black and red into their armor, breaking the typical Cadian green and khaki coloring. I hope to also tie in the red belts into the bases when they are completed. The army is coming close to completion- still 2 chimeras, one manticore, some more vet troops, and the psyker battle squad. Good choice of name... "The Black Jacks." Has a nice ring to it, I'd say. Have you thought about a regimental number? Glad you're back from vacation and that you're getting some hobby time again. Oh yeah, I like their red belts but am kinda confused what you mean about tying them in with the bases. Yeah Doc! That's a solid Cadian Sounding name! 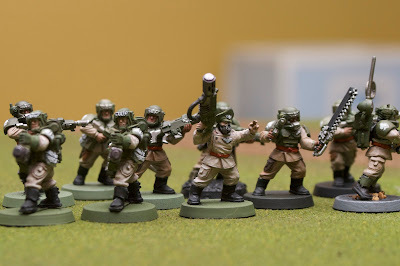 Nothing wrong with a little splash of color in the Cadians either. The models look good so far!